"This is a big change, consumers don't always love change," says Mehdi. 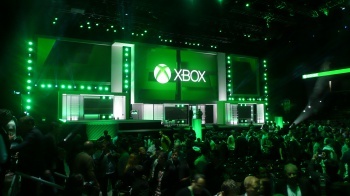 Audience reaction to the ongoing saga of the Xbox One is pretty much what Microsoft Xbox Chief Marketing and Strategy Officer Yusuf Mehdi was expecting, but then this is a big change, and people don't always like change. "There's a lot of education we have to provide to make sure that people understand," says Mehdi. He went on to add that "we're trying to do something pretty big in terms of moving the industry forward for console gaming into the digital world. We believe the digital world is the future, and we believe digital is better." There's plenty of benefits in cloud connection, Mehdi claims. You'll be able to take your library with you wherever you go, so long as there's a decent connection. You can even digitally loan copies - up to a limit of ten - and there could be other, as yet undefined benefits. "You can imagine the capability to have different licensing models, different ways that people have to access games," says Mehdi. "This all gets unlocked because of digital." As to what those different ways could be or what they might mean for the industry, Mehdi was reluctant to go into details. As for DRM and used games, limits and potentially fees are a necessary evil, Mehdi claims, as Microsoft needs to keep publishers happy as well as consumers. "We do want to support everyone in that system, beginning with the consumer," he said, "but we want publishers to get paid for the great IP they work on." And the negativity? Well, it may not matter so much to Microsoft. Sure, core gamers complain, but the folks who don't really pay attention and who just want a fancy box will be fine with Microsoft's Xbox One. "In a broader set of community, people don't pay attention to a lot of the details," said Mehdi. "We've seen it in the research, we've seen it in a lot of the data points." What about the extra $100 you'll be paying for the Xbox One, over the PS4? Again, Mehdi doesn't see a problem with that. The Xbox One will deliver so much increased value over the PS4 that a piddling $100 will be neither here nor there. "Ultimately consumers will decide which is better," Mehdi said. "It's a big market."